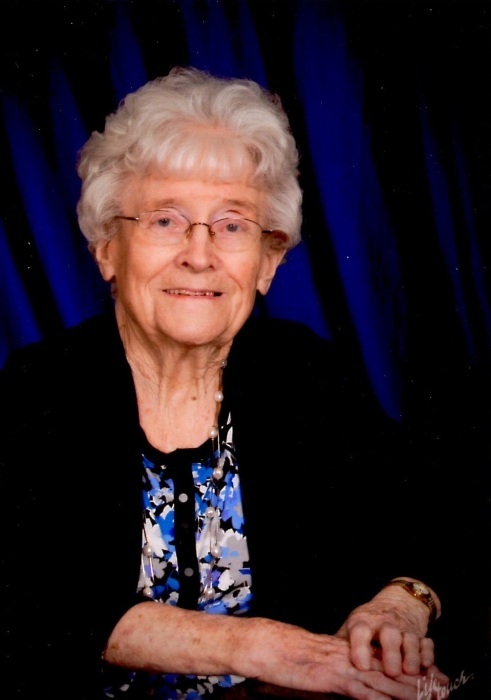 Juliette E. Scherer (nee Driscoll), 95, of West Bend, passed away on Thursday, April 5, 2018 at Cedar Home Health and Rehab. She was born on November 19, 1922 in Cedarburg, WI, the daughter of the late William and Mary Driscoll (nee Nolan). She married the love of her life, Leroy Scherer on June 16, 1945 in Milwaukee. Juliette was a member of the Saukville American Legion Auxiliary for over 50 years and was a charter member of the Saukville Historical Society. She was an avid gardener and canner; she grew the best pumpkins in Ozaukee County for many years. Most of all, she liked spending time with her family. Those Juliette leaves behind to cherish her memory include her children, Rose (Jerry) Steffen of Malone, WI, Nola (Cal) Luft of West Bend, WI, and Bob Scherer of New Holstein, WI; grandchildren Amy Stewart, Rebecca Hobbs, Anne Blaedow, Sara Depies, Scott Mickelsen, Christopher Mickelsen, Jason Mickelsen, Jade See, and Robert Scherer; 11 great-grandchildren; son-in-law, Jim Meeuwsen; nieces, nephews, other relatives and friends. In addition to her parents, Juliette was preceded in death by her husband, Leroy; son, Bill Scherer; daughter, Jane Meeuwsen; great-granddaughter, Amanda Ducsay; and her siblings, Ambrose Driscoll and Beatrice Neigelsen Weinkauf. A funeral service in remembrance of Juliette will be held on Saturday, April 14, 2018 at 1:00 p.m. at Immanuel United Church of Christ, 501 Walnut St. West Bend, WI. 53095. Juliette’s family will greet relatives and friends at the church from 11:00 a.m. until the time of the service. The Saukville American Legion Auxiliary will do their walk through ceremony at 12:30 p.m. Burial will take place at St. Finbar Cemetery at a later date. Since Juliette’s favorite color was red, please honor her by wearing something red to the funeral. In lieu of flowers, memorials are appreciated to the Saukville Historical Society or the Saukville American Legion Auxiliary. Juliette’s family would like to thank the Cedar Home staff and Cedar Hospice for their compassionate care and support.